The history of Kumdo and Kendo is intertwined such that, stylistically, they are very similar. 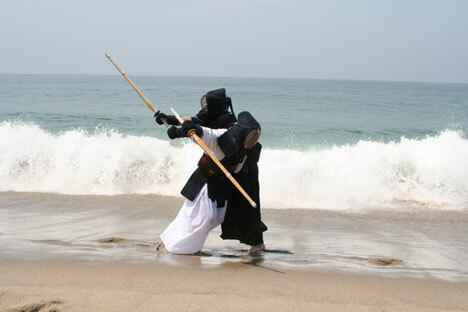 Some have gone on to say that Kendo relies on patiently waiting for an opening to reveal itself before striking, while Kumdo is more proactive in using techniques to create opportunities to strike. Whatever the differences, they are very slight, as can be evident when watching a match between the two methods. Gumtoogi, however, completely changes the dynamics of a match by extending beyond the current limit of upper body strikes. The introduction of lower body (leg) strikes opens another opportunity for the fighter to strike his opponent, thereby creating more chances for attack and more areas that must be defended. Secondly, Gumtoogi matches fighters with different types of swords against each other, changing the balance and attack strategy for each encounter dramatically. An attacker with a long sword has to radically change the way he will engage an opponent with twin swords or one sword and one short sword, for example.